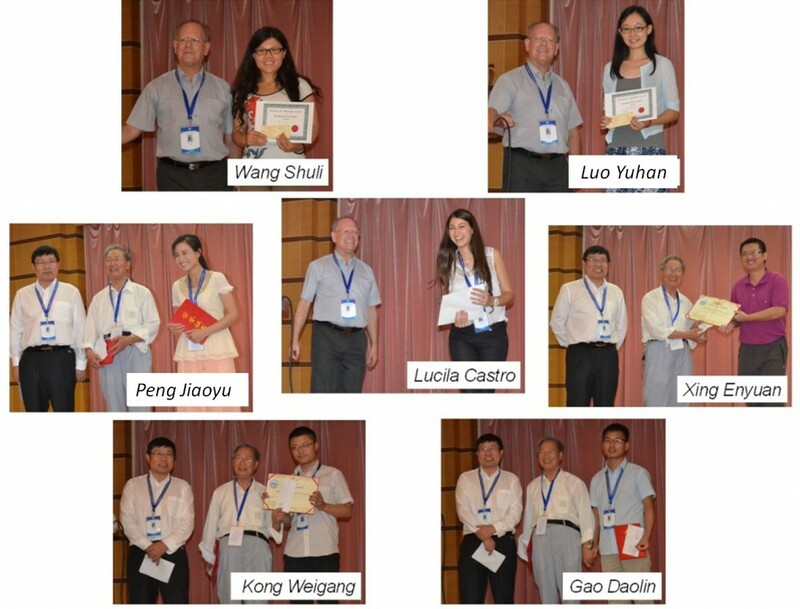 The 12th International Conference on Salt Lake Research was successfully held on July 14–18, 2014 in China. The conference was jointly organized by the International Society for Salt Lake Research (ISSLR) and Research and Development Center for Saline Lake and Epithermal Deposit of the Institute of Mineral Resources (Chinese Academy of Geological Sciences). The conference was opened with plenary talks by Dr. Aharon OREN (Israel) and Dr. Mianping ZHENG (China). During the following five days, researches focused on limnology, sedimentology, geology, geochemistry, biology, ecology, management and conservation issues; they presented about 100 talks and the same number of posters. The topical sessions were organized on the 1) Global Change and Salt Lake Record; 2) Salt Lake Ecology and Biological Resources; 3) Geochemistry and Biochemistry; 4) Salt Lakes, Surrounding Environments and Environmental Management; 5) Salt Geology and Resource Prospection; 6) Chemistry and Chemical Engineering; 7) General Issues. The “talk to talk” overview of the conference is not necessary as the extended abstracts of the conference were published in the Acta Geologica Sinica (Vol. 88, Supp. 1, 2014) and the special issue of 15 papers presented in the conference has been published in Chinese Journal of Oceanology and Limnology (CJOL). CJOL is one of the sponsors to the conference. This special issue can be accessed by clicking here. The conference was dominated by geology and paleolimnology, chemistry and chemical engineering talks. This is quite understandable as China’s vast present and former saline lake resources are used for salt extraction and processing. The post conference field trip to Quinxai-Tibet province with the visit to several salt extraction plants clarified the trend. The salt lake resources discovered by Chinese scientists in previous years are now the basis for the growing economy of the extensive region. This development reminds of the Soviet industrialization, when all efforts of the society, from science to art and ideology, were put into the economic development and transformation of the country. The geological and engineering topical dominance at the conference can be only partly related to the national priorities. The saline lake research in general is quite different from its aquatic counterparts. It is worth remembering a recent publication by the president of American Society for Limnology and Oceanography (ASLO) John A. Downing (Inland Waters, 2014, 4, pp. 215-232). In his paper “Limnology and oceanography: two estranged twins reuniting by global change” he discusses the differences between two branches of aquatic sciences. “Limnology and oceanography” is often considered as a brand that combines various aquatic sciences into one discipline. In spite of the number of general problems and concepts, the fields are still quite separate. Oceanography, from the point of view of inland water researchers, is a healthy, wealthy and self-sufficient area of research. As it was demonstrated, sea and ocean scientific papers had rarely cited inland water studies (A Salty divide within ASLO? Limnology and Oceanography Bulletin 22(2), 2013. P 34‐37). The scale of the ocean/sea ecosystems and their significance (global climate system/global carbon cycles/aquatic resources) for the humans automatically make this area of research important and well-funded. Inland water research is considered less valuable. There is less money, the ecosystems are smaller, and the journals are not so prestigious. Inland water research papers very often cite the ocean/sea research (probably they hope to catch the attention of the senior brother) but there is nor response. However, the picture can be even more complicated if we divide the inland waters into saline and freshwater. In this case, we can talk about triplets – an old and respectful oceanography, a younger but ambitious freshwater research, and a small and lagging behind saline research. I have scanned the programs of recent SIL (Budapest, 2013) and ASLO (New Orleans, 2013) meetings. Out of almost 400 talks and posters at the SIL meeting only about 10 were about salt lakes/marshes. The same proportion is relevant for ASLO meeting – about 60 presentations out of 1700. This 2-3% strictly (and probably just coincidentally) matches the proportion of “salt/saline lake” papers in the Web of Science compared with “sea/ocean” and “lake” counts (in 2013 there were about 30000 “sea/ocean” papers, 9000 – “lake” papers and 1100-1200 “salt/saline lake” papers). This ratio is disappointing as the percent of saline lakes out of total water on the earth is just slightly lower (0.0006) than the percent of freshwater ones (0.0008) (Management of Inland Saline Waters, 1998, Edited by W.D. Williams). Nevertheless, the result is that for those who study sea/ocean, salt lakes are just small lakes; freshwater researches consider saline lakes not relevant for their research, as they are saline. Being somewhere in between saline open waters and inland freshwater lakes, salt lakes finally get less attention. In my brief analysis of saline lake publication activity for three years (2011, 2012, 2013), the trending topics were the same: organisms that live in extreme environments (usually in hypersaline or anoxic habitats); paleolimnology and reconstruction of the historical levels of salt lakes; geochemistry and salt engineering. Out of these three trending topics, two were well presented at the 12th conference. What are the missing areas of research that might be of great interest for the wider scientific community? There are two topics that probably need to get more attention. What is specific for salt lakes is that water in these lakes is salty. Sounds like a tautology. There are two main factors that control water density in aquatic ecosystems – temperature and salinity. The stable or temporal variations in water density between different water masses (either vertically or horizontally) are the driver for many hydrophysical and related ecological processes. Currents, stratifications, internal waves, turbulence, seiches, low oxygen (or anoxic) zones – the list of phenomena can be continued. All these are of great importance for any large volume of salty water (ocean or sea). All this is present in any smaller saline volume of water (lake). There is no approach or theory to scale processes from lake to the ocean. However, a small saline lake with internal waves, stratification, and low oxygen zone is easier (and cheaper) to study comprehensively than the ocean. I believe that those who want to understand hydrophysics in the ocean might get good answers and comprehensive understanding of the processes by studying small saline lakes as models of the bigger water bodies. We know that saline lakes are very sensitive to climatic variations. Located in arid climate they depend on the amount of precipitation/run off and the rate of evaporation and can change in size and volume in a relatively short time. The examples of the Aral Sea, Lake Urmia and the Dead Sea shrinking or expanding (in the past) are well known not only because of intense scientific research but also because of mass media attention. Variations in lake levels/volumes lead to changing salinity that shapes the biology of lakes. These changes can be dramatic both in terms of severity (the variation of salinity from several grams per liter to hundreds of grams per liter) and speed (not several million or even thousand but just a few years). Even though these changes are evident and very often recorded, it seems that they are not explicitly analyzed. Rapidly changing in volume and salinity, the salt lake is a perfect natural laboratory that demonstrates how the food web and regional species pool adapt to this environment. The ecological concepts of stability, resilience, steady state, adaptation can be tested and probably defined more precisely by studying such systems. The next International Conference on Salt Lake Research will be held in three years. The meeting in Beijing demonstrated that the community of salt lake scientists is strong and growing in numbers. The contacts with the global saline system (ocean/sea) scientists and theoretical biologists should strengthen the field. Let us hope that in 2017, we will have another great symposium!